Why is devo-max so popular? 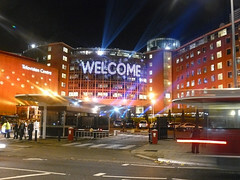 BBC Television Centre by Mike Fleming, on Flickr. They forget that London is a global city (37% of the population were born outside the UK), so it would be rather strange if London suddenly refused to accept people from Scotland after independence. They also forget that for many people moving to London isn’t a choice, it’s a necessity. There simply aren’t enough opportunities in Scotland. Scotland has had no shortage of broadcasting talent, but it largely gets exported to London, which is why Scottish accents are so prevalent in the media village. Anyone who wants to get on in the BBC has to go to London — as I did — because that is where the jobs are, where the careers and the budgets are. I spent more than 20 years in the BBC, nearly half of it in London, and it seems to me that the present situation is the worst of all possible worlds. Many Scots do try to come back from London, of course, but it is a big risk. I was speaking recently to one of my contemporaries, who started in the BBC when I did and became one of the best documentary film makers in Britain, with a string of Baftas and other awards to her name. She tried to come back to Scotland three years ago, and found she simply could not get any commissions from the BBC. So she had to go back to London. If you are not in the metropolitan village you are little people. I definitely think it’s good for many young people to travel and see the world, but if the only job openings within a given field are in London, they can hardly be described as opportunities any more. Danes would never put up with a situation where many careers forced people to move to Stockholm, Berlin or London. Why should Scots? I want my kids to have the opportunity to have rewarding careers in Scotland if they so desire, and ideally also to be given a chance to work anywhere in the world if that’s what they want to do. However, I don’t want them to be forced to moved to London. We need independence to create the careers at home that people need. Creating more opportunities here doesn’t mean that the jobs abroad suddenly disappear. On the contrary, they go from being forced choices to being genuine opportunities. Considering the cost of accommodation and commute, how much of an opportunity is London? It looks more like a prison to me.